For the past 40-50 years we have known through research, that carbohydrates are the best macronutrient for physical performance, both sustaining and improving results. A panel of experts met in February 2018 to discuss the latest science and their convention turned to potato-talk frequently. APRE (Alliance for Potato Research and Education) had concluded by the end of their brainstorming, that carbohydrates are still an indispensable energy source for physical activity, despite recent fads and trends away from carbs. Diet, especially in the sports world, is often focused on and frequently misunderstood. Basic food principles are often overlooked in an effort to find the next “big idea”. The misunderstanding is due to recent trends, for inactive people to reduce carbohydrates for health reasons, but athletes and active people must still consume carbs to enhance muscle glycogen storage and energy delivery during exercise. I can see our CEO Chris Claridge grinning at the news, that now he is in training for a marathon, he can dig in to his spuds. To meet nutrient requirements, when leading an active life and especially when training, a few constants remain, particularly the need for carbs, protein and fluids, ideally from natural, whole food sources. SPUDS SPUDS SPUDS – these will fuel training and recovery. Carbs are efficiently broken down by the body, rapidly enough for exercise needs and also to replenish stores of energy after exercise. Experts on the panel expressed their concern at the increasing popularity of low-carb diets in active people and called them “more faddish than practical”. Train-low diet regimens can potentially compromise performance and even impair cognition, mood, create fatigue and inability to focus. 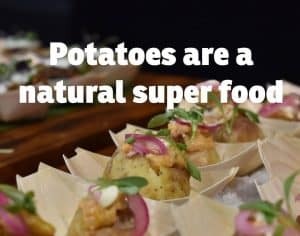 The great thing about potatoes, not only for high-performance athletes but all consumers, is that they have so many other nutritional benefits too: high levels of potassium, B vitamins, Vitamin C, iron, fibre and protein – greater than most non-animal and some animal sources. There may even be, as yet other undiscovered phytonutrients. 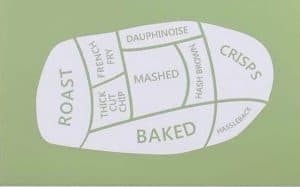 So there you have it – you can have your spuds and eat them too!